Also in 2010, BrewDog produced a 55% ABV freeze-distilled beer called The End of History, with the bottles packaged in small stuffed animals, priced at £500 and £700 each. Only 12 bottles were produced; 11 for retail sale, with the other one going to Internet video blog BeerTapTV. BrewDog claim that this set new records not only for alcoholic strength in a beer, but also for price. Advocates for Animals called the gimmick 'perverse'. The title "strongest beer of the world" then fell back to Mr Tscheuschner from the Schorschbräu brewery in Germany, whose Schorschbock 57 boasts an ABV of 57.5%. The title for world's strongest beer has since changed again though. 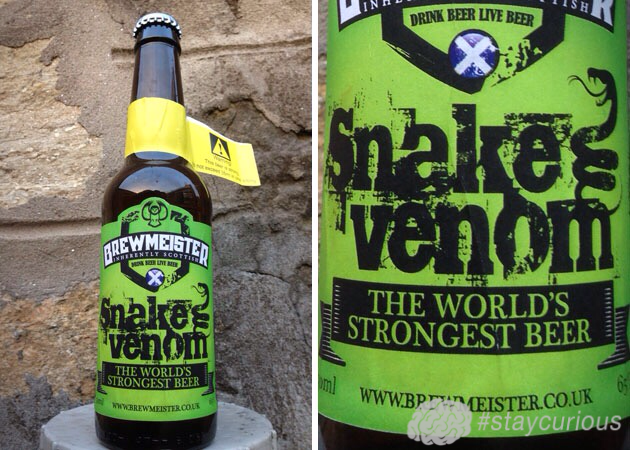 It is now allegedly Brewmeister's Snake Venom at a reputed 67.5%, although independent testing has yet to be published to confirm the ABV. Don't forget to check out our Kickstarter Campaign! If you love Curionic pledge what you can! Even a dollar and a share helps! Freddie Mercury dressed Lady Diana in drag and snuck her into a gay club.